Welcome Offer: Get 5% cash back on all eligible purchases (up to $300 cash back) for the first 6 months. Earn 2% cash back on all purchases when your Welcome Rate ends. 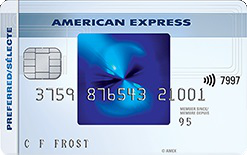 New SimplyCash™ Preferred Card from American Express Credit Card Cardmembers can earn 5% cash back on all eligible purchases (up to $300 cash back) for the first 6 months of Cardmembership.